The Diocese of Buye has operated a Bible college since the 1930s. Originally it served a catchment area including all of Burundi, Rwanda, and the eastern Congo, and was funded by the Church Missionary Society (CMS) in England. CMS discontinued its funding a few years ago, but the need for the college is as great as ever. With nearly 300 congregations, the diocese has a great and ongoing need for clergy, and the available alternatives for theological education are few. The nearest accredited Anglican seminaries are in Uganda and Kenya and the cost of going there is prohibitive for most Burundians. This year, thanks to funding from the Diocese of Edmonton, the college is able to operate at its full capacity of 28 students for the first time in many years. Three of the students are women, which is the highest representation ever. Three of the men are in their third year and, God willing, will be ordained deacon next spring; all the others are in their first year. They are all experienced catechists from parishes throughout the diocese. Catechists are somewhat similar to lay readers and are a key component of the church in Africa, where there are never enough ordained pastors to conduct weekly services at all of the churches. Most of them are married with children, so coming to Buye for full-time education represents a considerable personal sacrifice. The curriculum includes scripture, theology, church history, homiletics, liturgy, and pastoral training, as well as practical subjects including English, French, mathematics, health, and music. There are two full-time instructors plus a number of diocesan clergy (including the bishop) who teach individual courses. A careful process of discernment takes place throughout the three years of course work and summer placements. Some of the students will likely return to their parishes after one year as well-trained catechists; others who are found to have a vocation to the priesthood will stay for two more years and be ordained. The college is an integral part of the Buye Hill complex which also includes the cathedral, hospital, secondary school, and residences for the bishop and other clergy, who have already noticed the renewed energy from having 28 highly committed students on site. All of them have asked me to convey their thanks to the Diocese of Edmonton for its help, which has come at a critical time and will make a lasting difference for the Diocese of Buye. John Gee, a member of the Diocese of Edmonton, recently returned from Burundi, working in the Diocese of Buye for a three-month stint. We welcome this guest post to the blog. In the Diocese of Buye, development is considered an integral part of Christian mission. Ministry here addresses the whole person; if people's bodily needs aren't being met, their spiritual life also suffers. It isn't primarily a matter of providing direct assistance to the poor, although that can be important, but of providing them with the tools to improve their lives. Rev. Jean Berchmans, the diocesan development coordinator, looks at his projects as signs of Christ's kingdom already in existence but not yet fully revealed. The Mothers' Union (the equivalent of our Anglican Church Women) operates programs in adult literacy and savings and credit which are open to both men and women of all faith traditions. The literacy curriculum uses participatory learning methods, with content based on life issues including HIV, gender violence, poverty, equity, maternal health, and care for the environment. Graduates of the literacy program are encouraged to participate in savings and credit groups. These groups use a “lending circle” microfinance model that incorporates savings as well as loans. Each member makes a set weekly contribution to the fund, which then provides selected members with loans for microbusiness as well as emergency assistance with family issues. In addition to combating poverty, this method builds a sense of community and fellowship among group members. They also learn business skills including marketing, planning, financial management, and the legalities of forming an organization. Another key aspect of development is food security. The diocese operates a program that supports farmers to grow sorghum, a nutritious and drought-resistant crop. It ensures that they can feed their families adequately and also provides a source of cash income: there is a ready market for sorghum for use in making beer. Another program distributes livestock (goats or cows) to community members as a source of dietary protein and, just as importantly, of fertilizer to maintain Burundi's excellent but overused soil. Dairy cows are distributed to pastors to supplement their very small stipends; the calves are in turn passed on to other pastors so that the program is self-sustaining. A third key area is water and sanitation. Burundi is rich in ground water, but the natural springs are easily contaminated by livestock and poor sanitary practices. The result is a great deal of illness and death from water-borne infections, particularly for children. The diocese has perfected a method of improving the springs by installing a simple filtration system, plumbing, a concrete headworks, and protective fencing so that the water is kept clean and safe to drink. It also tastes good! The church also sets up a village committee to ensure the spring is maintained. An investment of around $1000 Canadian can provide a village with safe drinking water indefinitely. You can also read about the experiences of previous delegations from the Diocese of Edmonton, who learned about development projects including literacy classes, and microfinance groups (here and here). Bricks and mortar have not always been a priority for the Anglican Church in Burundi. It is said that at one time you could spot the Anglican church in a village from the type of construction. The Catholic and Pentecostal churches had brick walls and steel roofs; the Anglican church had mud walls and a thatched roof. Churches made of these materials do not hold up well in Burundi's rainy climate; moreover, many of them were destroyed during the civil war in the 1990s. When Bishop Sixbert was consecrated in 2005 there were only 11 brick churches in the diocese. Since then, 12 more have been built. The bulk of the materials and labour are contributed by congregation members. Few of them have money, but they do have time, skills, and natural materials. The bricks are made by hand from local clay and fired in outdoor ovens. Timbers to support the roof are cut from local trees. The only materials that have to be purchased are iron sheets for the roof and cement for the floor. The congregation is expected to take the initiative to begin construction; once the walls are up and pass inspection, the diocese provides the iron sheets for the roof. For the last couple of years these have been purchased with funds contributed by the Diocese of Edmonton. This type of construction is sturdy. The cathedral, built in the 1930s, still has the original iron sheets in its roof and they are still in good condition. The diocese has found that good buildings are essential to a missional church. Once a parish has a permanent building, it becomes more prominent in the community and attendance goes up. A parish here is not officially named until it is consecrated, and it is not consecrated until it has a facility that meets diocesan standards. You can read more about church construction in previous posts about visits to Mubanga and Ngoma. When I first contemplated going to Burundi, I found that I had very little knowledge of its geography and history. Burundi is sometimes called the "heart of Africa" because it is heart-shaped and close to the middle of the continent. It is also called the "Switzerland of Africa" because of its landlocked position, mountainous terrain, and mixture of French and German influences. Hills are so ubiquitous in Burundi that the official name for a village, the smallest municipal government unit, is "colline" (French for hill). Burundi has about 10 million people in an area of 27,834 square kilometres - about three times the population of Alberta in only 1/24th the area. Despite this, the country is overwhelmingly rural. Ngozi, the third largest city, has a population of around 50,000. Land is the most valuable asset and every bit of it is in use, right up to the tops of the hills. Fortunately the soil is very fertile and the whole country (except for a small area in the northeast) is blessed with abundant rainfall. The rainy season begins in mid-September and lasts until the spring. The history of Burundi is unlike that of other parts of Africa. When the European powers divided up Africa at the Berlin Conference in 1885, Burundi had not yet been explored by Europeans and consequently was not spoken for. Shortly afterwards it was occupied by Germans coming from neighbouring Tanganyika. When Germany invaded Belgium in 1914, the Belgians retaliated by invading Rwanda and Burundi from the adjacent Belgian Congo. The two countries were under Belgian rule until they became independent in 1962. Another unusual thing about Burundi is that there is only one vernacular language, Kirundi, which is spoken by members of all tribes. This is a unifying factor that most African countries lack. French is the language of professional communication, and an increasing number of people also speak English. The Diocese of Buye originally included all of Burundi when it was established in the 1930s, but is now one of seven Anglican dioceses. It includes the provinces of Ngozi, Kayanza, Kirundo, and part of Muyinga, comprising the north end of Burundi next to Rwanda and Tanzania. In addition to Ngozi, the major towns are Kayanza and Kirundo. Most of the churches are in small villages that can only be reached by very bumpy dirt roads. The most remote part of the diocese, in the east, can only be reached by going through the neighbouring diocese of Muyinga. Buye itself is a village (located, of course, on top of a hill) where the first Anglican missionaries established their base of operations. The cathedral and the bishop's residence are still there, but the diocesan offices are located in Ngozi about 10 kilometres away. Buye's other claim to fame is that the current president of Burundi, Pierre Nkurunziza, was born there. He also happens to be Anglican. 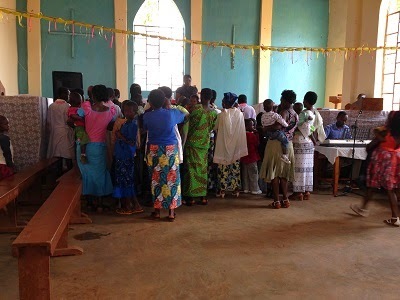 Anglican services in Burundi tend to have a strong Evangelical flavour. Sunday morning at St. John’s, Ngozi the service was Morning Prayer – the first time I have experienced that on a Sunday morning in years. Services last for at least two hours and no one complains. Every church has 4 or 5 choirs (children, youth, young adults, women, mixed) and each of them has to make a contribution. St. John’s has a particularly good music director who accompanies on both electronic instruments and traditional drums. Perhaps the most enjoyable for me is the unaccompanied singing - everyone here seems to have an enviable sense of rhythm and pitch. In Tanzania I found I could sing along phonetically in Swahili fairly easily, but Kirundi is more challenging! Nevertheless I enjoy following the printed words and noticing familiar patterns in prayer, hymns, and scripture. Usually I am sitting next to someone who can interpret so that I get the gist of what is happening. I am always welcomed during the announcements; I find the attention a little overwhelming, but the hospitality is unmistakably genuine. On Saturday I helped out at a Community Works project. Every Saturday, all over Burundi, people volunteer to work on infrastructure projects in their local communities. Originally the purpose was to rebuild what was destroyed in the civil war, but now that has largely been accomplished and new projects are being tackled. I was working on construction of a new local government office in Buye, near the cathedral. We were pouring the concrete floor slab. Pouring concrete is not the same in Burundi as it is in Canada. There is no cement truck. The concrete is mixed in a shallow pit in the ground. Most of us formed a human chain to carry the wet concrete in plastic containers to where it needed to go. There were hundreds of people there, many of whom engaged in energetic singing and dancing to keep up the energy level. Bishop Sixbert participated, and the president of Burundi, who is Anglican and originally from Buye, was supposed to put in an appearance but was delayed. His advance guard did show up and helped mix concrete.